The Morgan Park Beverly Hills Business Association invites you to their first annual Jambalaya Jam & Cook-off. The festive cooking competition and tasting party will be held on Monday, March 4. It starts at 6:30 pm at Cork & Kerry, 10614 S. Western Ave., and ends at 9 pm. Enjoy jambalaya from 13 participating businesses competing to be the best on the South Side! All guests will be able to vote for their favorite jambalaya for the People’s Choice award. Chef Erich Wennberg from the Maple Tree Inn will select winners in the Judge’s Choice category. 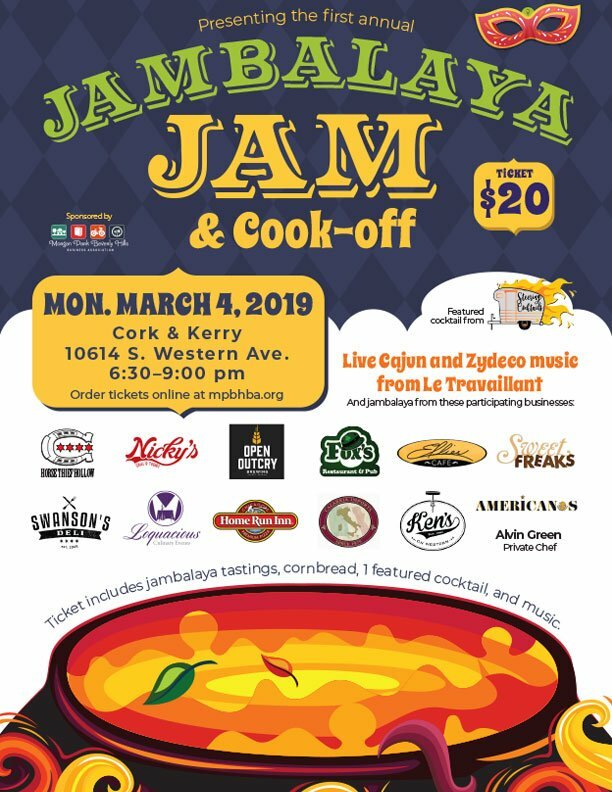 Your $20 ticket includes tasting portions of all 13 jambalayas, plus cornbread, a New Orleans inspired cocktail crafted by Lizzy Benner of Steering Cocktails, and live Zydeco music by Le Travaillant. A cash bar will be available.